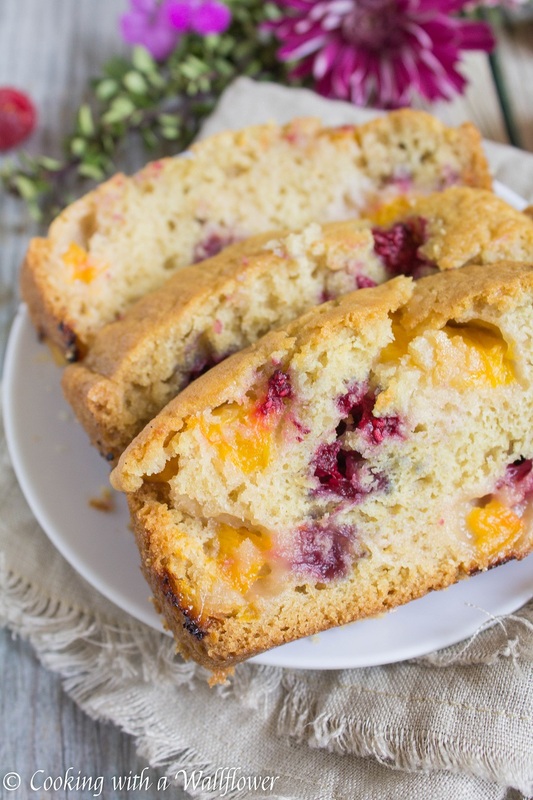 Filled with fresh raspberries and apricots and a hint of almond, this seasonal bread is moist with a crunchy top crust. 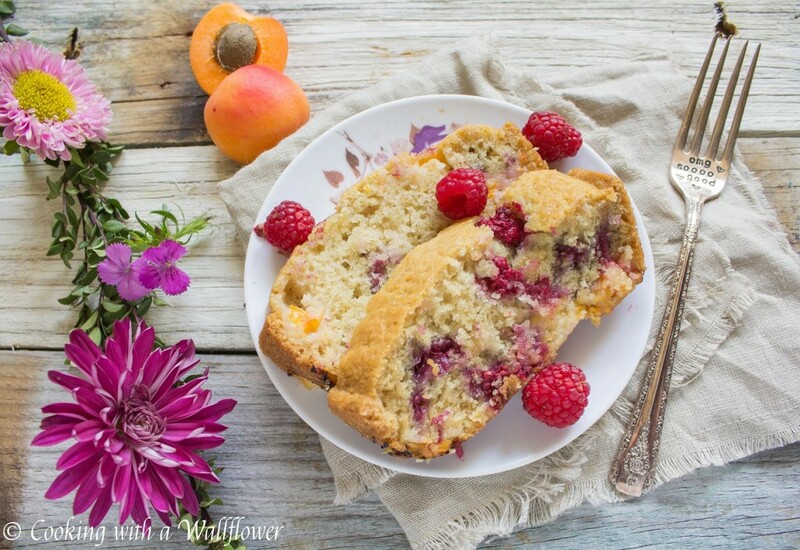 This raspberry apricot bread is delicious and perfect for a summery breakfast. Did you have a wonderful weekend filled with lots of sunshine and ice cream? Unfortunately, the weekend is over, and it’s another Monday, which means we all have to head back to work. 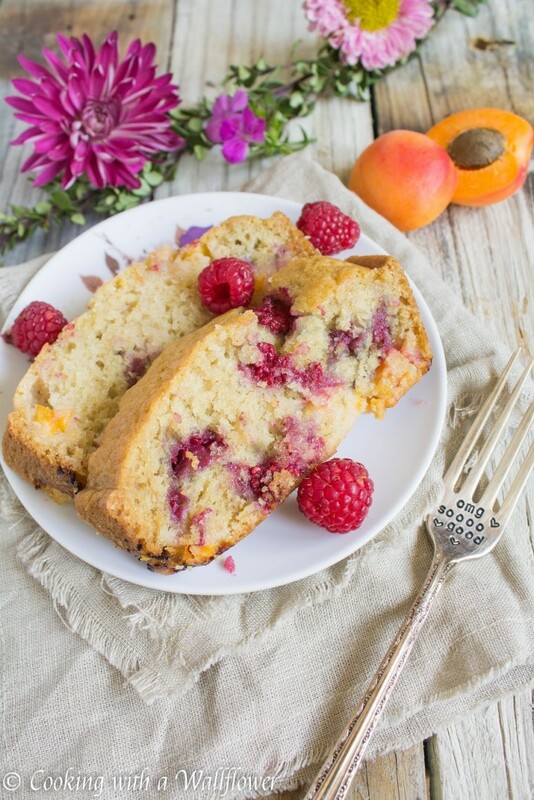 But I thought I’d share with you this raspberry apricot bread. Just a little pick me up to brighten up your week until it’s the weekend again! This week, I’m going to be a little busier than usual. We have guests arriving from New Orleans Tuesday! I love having family and friends visit. It’s always fun hanging out with them, especially when you don’t get to see them that often. But it almost always seems to happen around the time when I’m most busy with work. Do you feel like that too? My relatives from New Orleans are arriving this week for my grandma’s birthday next weekend. Every year, we celebrate her birthday at some restaurant. For years it was the same location every year. But the last few years it has been a little random since the original restaurant’s service and food quality has declined over the years. I mean, a hike in prices and smaller portions doesn’t seem fair. 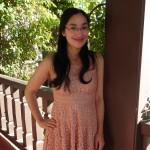 We’re looking for a good Chinese restaurant perfect for big gatherings in the San Jose, South Bay area. So if you have suggestions, I’m all ears. But for our family, our grandma’s birthday is a big deal. We have family arrive the days leading up to the birthday dinner. We make reservations for all our family and friends, and we all dress up. It’s like a huge family reunion. 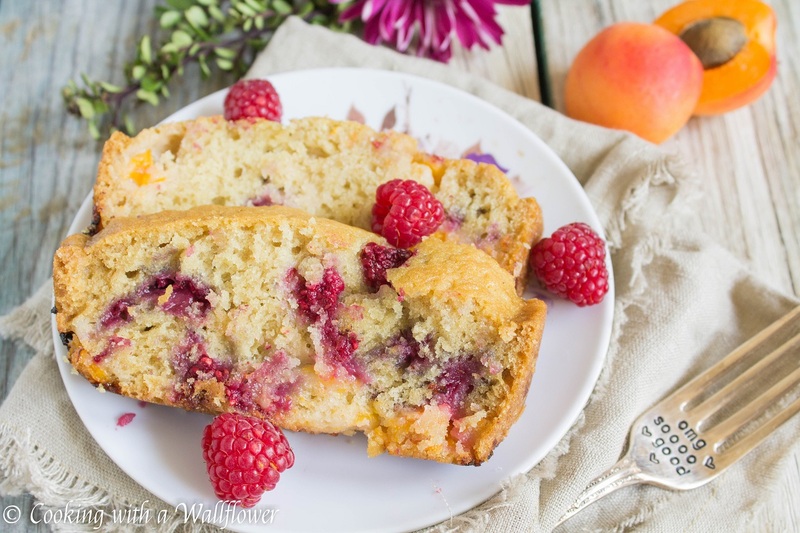 I love that I can have this raspberry apricot bread to look forward to all week long. 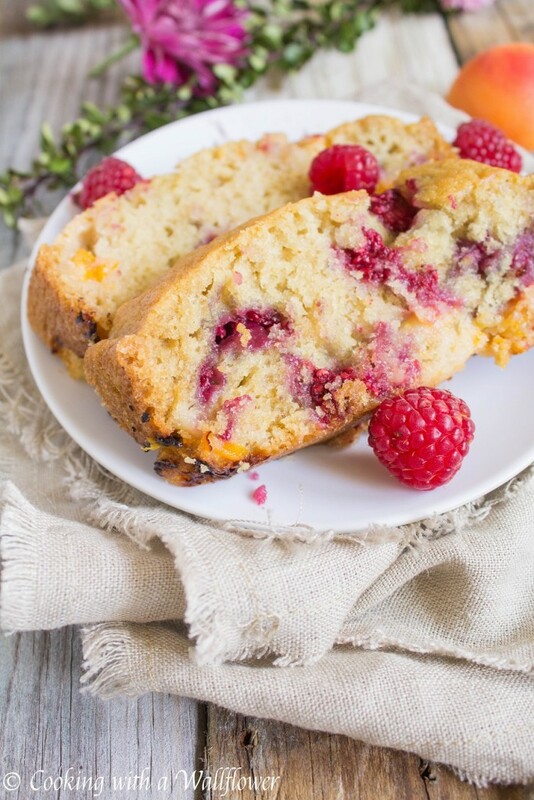 Moist bread with a hint of almond in every bite filled with fresh sweet raspberries and ripe apricots. This bread is incredibly delicious and summery. Berries + stone fruits are what summer is all about. Well… Plus a bajillion other things, like sunshine, flowers, beaches, and travel. But you probably know by now that my obsession with berries and stone fruits just never ends. Preheat the oven to 350F. Lightly grease a 9×5 inch loaf pan with vegetable oil or nonstick cooking spray to prevent the bread from sticking to the sides. In a large bowl, combine flour and baking soda. Set aside for now. 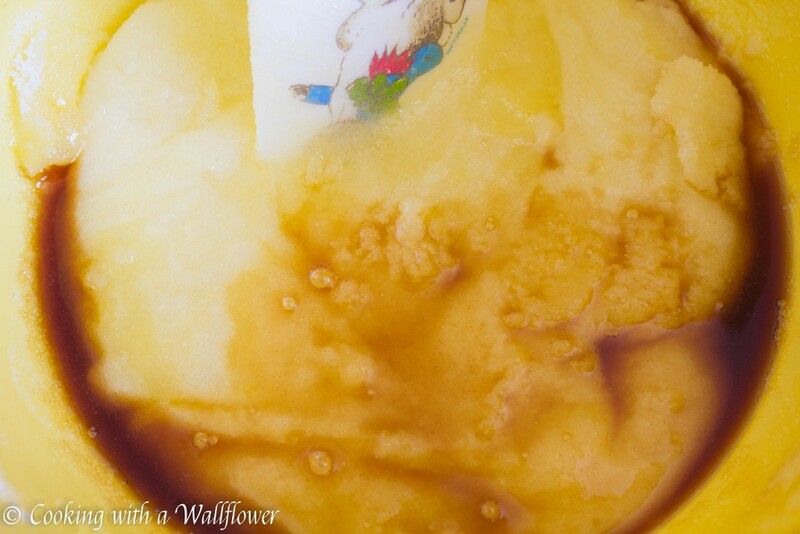 In a separate medium sized bowl, mix together a large beaten egg, granulated sugar, and vanilla extract. Once these ingredients are well incorporated, whisk in almond milk and vegetable oil. Pour the wet ingredients into the dry ingredients. You want to combine the ingredients until they are just incorporated. Try not to over mix otherwise the bread won’t be soft and moist. Fold in the raspberries and the chopped apricots. You want to gently fold in the raspberries since they’re delicate and will likely break apart. Pour the batter into the loaf pan. 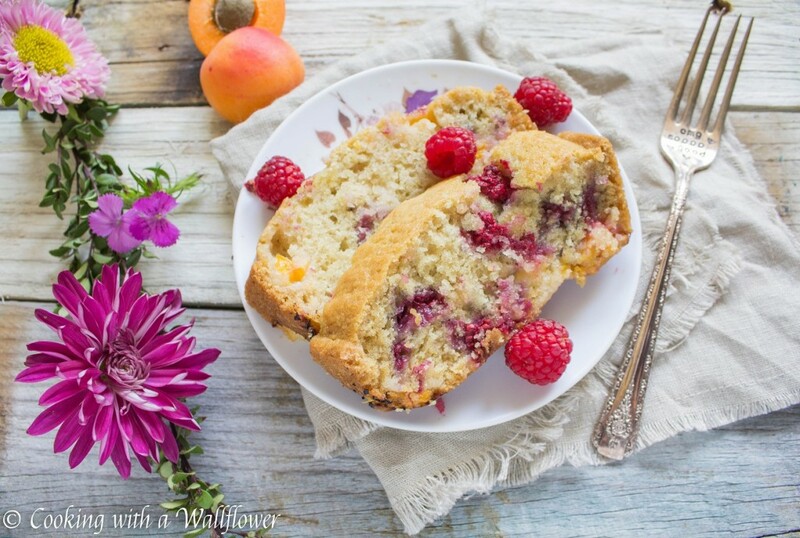 You can add a few more raspberries on top for a splash of color. Bake the bread in the oven at 350F for about 50-55 minutes until the bread is brown. Insert a toothpick into the bread. If the toothpick comes out relatively clean, the bread is done. Test the area around the fruits. It takes a little bit longer for the bread around the fruits to become firm. Allow the bread to cool for several minutes before slicing into it. Preheat the oven to 350F. Lightly grease a 9x5 inch loaf pan with vegetable oil or nonstick cooking spray to prevent the bread from sticking to the sides. 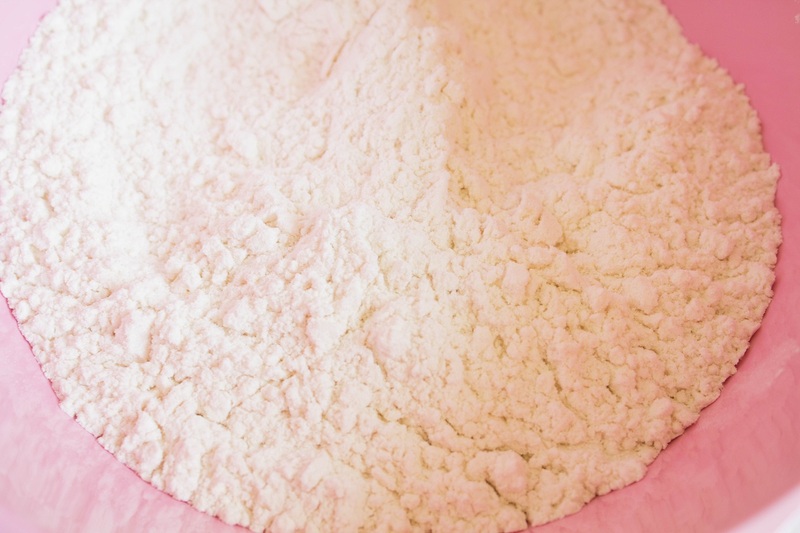 In a separate medium sized bowl, mix together a large beaten egg, granulated sugar, and vanilla extract. Once these ingredients are well incorporated, whisk in the vanilla almond milk and vegetable oil. Pour the wet ingredients into the dry ingredients. You want to combine the ingredients until they are just incorporated. Try not to over mix otherwise the bread will not be soft and moist. Gently fold in the raspberries and apricots. Bake the bread in the oven at 350F for about 50-55 minutes until the bread is brown. Insert a toothpick into the bread. If the toothpick comes out relatively clean, the bread is done. 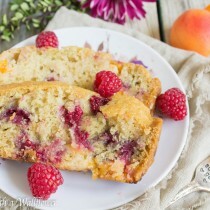 This entry was posted in Bread, Breakfast, Farmer's Market, Healthy, Quick and Easy, Recipes, Summer Cravings, Vegetarian and tagged berries, bread, quick and easy, stone fruit, vegetarian. Love fruit breads! This one looks delicious! Looks great. The colours of the fruit make it look even more delicious. Wishing you lots of luck during your busy week! Enjoy your company and try to avoid stress! Love your recipe and so glad you joined Fiesta Friday! This bread is just beautiful and sounds delicious!